Showing results for tags 'Fire Truck'. [Edit, 10 October 2018] Note: This thread is discontinued. If you're interested in more cars of this kind please join me on Flickr. [/Edit] Hi all, this is the second batch of the vintage cars series (more vehicles to follow). I have moved the last one (not yet indexed) to this thread. So the first thread (see http://www.eurobrick...opic=73182&st=0) contains 9 vehicles now. #10: Vintage Truck (Gangster Version) A simplified version of the more colourful Vintage Truck you can find here (#9). The presentation is strongly influenced by the amazing work of LegoManiac over on Flickr. Here you can see the vehicle in action. Don't ask me what's all this stuff, I don't ask them either. More pice here. #11: Vintage Fire Truck No openable doors, no detachable roof, no suspension, no steering - but a nice steering wheel and column ;-) This started as a mod of the fire engine from Fire Brigade 10197 but ended quite differently, although I have kept some details (e.g. the ladder). I really love the original truck but it didn't fit within the other vintage cars. I am not too fond of this kind of fenders, I must say - but since it's a truck the height is okay, I think. Couldn't think of a different solution here. Credits to Lego Fire Museum (http://www.mocpages....lder.php/106210), some inspirations) and BigBoy (http://www.1000stein...myimages/bigboy, use of the gray tires). More pics here. Thanks for looking, c&c welcome as usual! Hi all. After starting to collect modulars and displaying them as a group, I really wanted to include custom models along with it. I'm a big fan of 10197, but never thought the engine was much good! Being big into UK-styled fire engines, I thought I'd make my own. This is LARGELY inspired by MadPhysicist's design (https://www.flickr.com/madphysicist/) with a fair number of custom tweaks and designs. The plan is to further develop the chassis to allow for quick, easy redesign of the pump/tender to allow for multiple uses. In one of the example image below, I updated the front-end of the unit to be inspired by the old Dennis units used by TWFRS. Obviously it's not perfect, was just trying out a modular front end style! I'm looking for some constructive criticism for these designs to help them improve! I will happily release instructions once I have the design to a fair level..although I may end up trading them for a donation to a firefighter's charity. I decided I needed a place to land my new Life Flight helicopter. The solution – build a fire department heliport. I've also posted links to a couple of new fire apparatus MOCs on my Flickr. Everything is based on real fire apparatus. Let me know what you think. After a long time since I started make water pump for fire truck I finished this project. Water tank in only non-Lego parts (and hode and batteriy ) Truck have 4 PF motors. One XL motor is for driver, servo motor is for steering, L motor is for pump (2 pneumatic pump) and M motor have 2 functions. First is canon rotation and second is winch. Between these two functions you must switched manually. And one under the "hood". 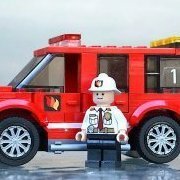 I've posted three new fire apparatus MOCs. The first is a Fire Chief SUV that uses Lego's new tires and mudguards from the Speed Champion sets. The result is a design that looks much more realistic and is more properly scaled in relation to my other fire MOCs. http://www.moc-pages.com/moc.php/433885 The second is a rig is based on the FDNY Logistics Support Unit. It responds to major emergencies with additional rescue supplies. http://www.moc-pages.com/moc.php/434036 The third is a Life Flight Helicopter. I wanted a more compact design similar to this helicopter and this helicopter. http://www.moc-pages.com/moc.php/432346 Please let me know what you think. Also, you can now view my MOCs on Twitter and Flickr. Thanks! Hi Folks! Today I introduce you to my Fire Ladder no.3, based on set 60112. I modified the engine (now two stud more long), and redesigned the trailer. The new features are a longer ladder in front position, 4 new main compartments, more storage boxes, accessories, an additional fire hoses and control panels. Hope you like it and be inspiration! Hello everyone! This is my Off Road Fire Truck 2, based on set 60111, I added two storage boxes, move inside the main fire hose, added control panels and accessories, on the roof of the truck there are two other fire hoses and lights. Hope you like it! Hi all! After a long absence I returned with new creations, and i hope you like. Today I share my Lego Fire Hazmat Unit, a truck with two hazmat suites, fire hose, and a lot of accessories as Geiger meter and metal detector. The style of this creation is inspired from Lego City set 60023. Two of the the official Lego fire sets this year are based on a snorkel design. This inspired me to make my own. The boom is entirely self supporting at many angles. See more photos at http://www.moc-pages.com/moc.php/429108 . Let me know what you think. This is my try at making one of the new NZFS MAN fire trucks. This is my Fire Utility Van no.2, the base is from 60003 Fire Emergency, year 2012. Has two small boxes, a big compartment, fire hoses with control panel and a ladder. This is my Fire Utility Van no.1, is based on model 60023 (from 60023 set "City Starter Set", 2013). Compared to the original, now has two big compartments, fire hoses with control panel and a lot of equipments. This is my Fire Lifter truck no. 1, based on model 7945 (2007 fire station set). Now it is longer, has a control panel for the hose, a great compartment and two smaller boxes for equipments. As promised I will continue to post images and descriptions of my fire trucks from my Fire Brigade. This is my Fire Engine no. 2, a special thanks to Oran Cruzen for letting me have this truck (bought on ebay) Now this truck has a fire hose, two equipments compartments, a lot of equipments and a ladder. This is my MOC of a conventional fire station in Taiwan and the ladder truck. Hope you guys will like it!